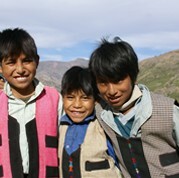 By means of this sponsorship, Tradecorp will support university studies of 8 young people of the Altiplano, Bolivia. In 2014, Tradecorp is collaborating with the NGO K’Anchay, which has been working with students from the Altiplano for the past 8 years. K’Anchay manages 8 boarding schools for children of farmers, operating as local educative collectivities in which children of farmers can access to a comprehensive education that ensures gender gender equity, equal opportunities and a high level of responsibility. In these centers, children receive the basic education, but also learn the basis of agroecology. K’Anchay also promotes the community engagement and selects formers students to work for a year as educators in one of its internships. Their engagement is recognized with with scholarships for their studies at university, which is the program Tradecorp is sponsoring in 2014. The engagement of young people goes even further as once they finish their studies, they return to their villages to help the development of the region.